HOUSE OF REPRESENTATIVES – The House Of Representatives approves the draft bill authored by Speaker Gloria Macapagal-Arroyo on Tuesday. The said draft bill is reported to revise the 1987 Constitution’s current form of government into a presidential-bicameral-federal system. Senators have been set to shifting through two chambers in order to vote as one, thus, saying that they have no time to approve the draft. The bill, however, passed in plenary by a voice vote during deliberations led by House Deputy Speaker Raneo Abu, in which they turned down the amendments to Resolution of Both Houses 15, that were presented by militant Rep. Antonio Tinio of party-list ACT. According to Leyte Rep. Vicente Veloso, chairman of the House committee on constitutional amendments, the plenary is expected to approve on third reading Resolution of Both Houses (RBH) 15, which is scheduled next week. 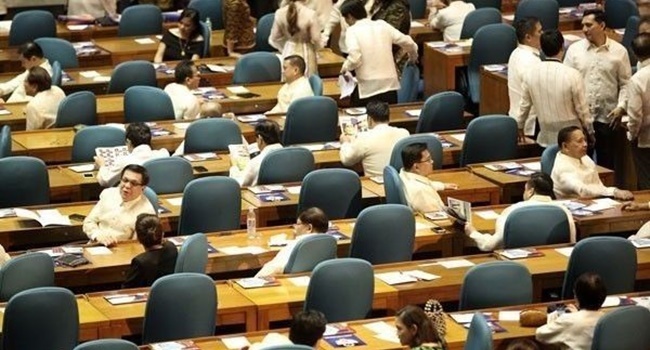 According to PhilStar, Rep. Rodante Marcoleta of party-list 1-Sagip, moved during Monday night’s session that debates on RBH 15 be after no House member stood up to interpellate during the deliberations. Few of the members of the militant Makabayan bloc, including Tinio, realized to House reporters that Arroyo’s bill would be approved on the second and third hearing. Tinio further added that the alleged intent was to “rubber stamp” the approval of a new constitution that will further tighten the stranglehold of political dynasties, undermine human rights and civil liberties and sell out the national patrimony and economy. As per the report, the House resumed plenary debates in late November on Arroyo’s draft bill, despite repeated delays. Veloso delivered his sponsorship speech while Zamboanga-Sibugay Rep. Wilter Palma II defended RBH 15. Arroyo said that in the draft, she added a provision that instead of establishing the federal states, there’s a mechanism establishing the federal states. Se further noted that ConCom and everyone else alredy passed the provisions. This is in order to make it her version of the draft, citing that it’s up for senators to lift the term limits.